It’s the season of giving… up things! Lent starts tomorrow and many people will be abstaining from their favorite things until Easter Sunday morning when they can once again indulge in their guilty pleasures. So we got to thinking – what could marketing professionals take away from this tradition? 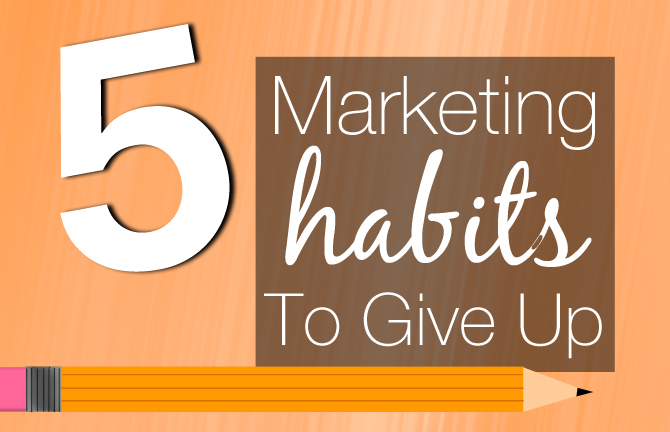 Here’s a few marketing habits that you should give up today, tomorrow and waaaay past Easter Sunday. Rather than focusing on the number of Facebook likes you receive, focus on engaging with your target audience. If 1,000 people like your photo on Instagram, but only 100 people are actually interested in buying your product, wouldn’t you rather focus on messaging to the people that are likely to make a purchase? Talking AT people, without letting them talk back, is a HUGE mistake – annoying people in both the real world and social world. If a customer (or potential customer) asks a question, has a problem, or even offers a compliment – RESPOND! It will make them feel like the company (YOU!) actually cares about them and will be more likely to share their positive experience with other consumers. Small companies have an advantage in the way that it is easier for them to connect with their target audience. They can build relationships with their customers and, in turn, gain more by word-of-mouth publicity. Small businesses should utilize the power of a relationship and use it to keep you competing with the big chains. Just because companies are all doing something, does not mean that your company has to do it. It’s actually great to stand out. In a world saturated with so much content, standing out and being different could be the best thing for yourself and your business. Don’t blindly follow fads because of their current success. Know your consumer, know what they respond to and try to predict what will catch their attention in the future. What’s your big idea? Are you following the goal of the campaign? Are you on strategy? You must ask yourself these questions every step of the way. Not doing so will cause confusion. Utilizing different media for a campaign is great! But you need to have an overall theme – otherwise it’s like your promoting two (or more!) separate projects with different tones, personalities and attitudes. Consistency, consistency, consistency! Following these five tips will keep your company ahead of the game. Remember to connect with your customer, use online and face-to-face experiences to your advantage and don’t feel the need to follow the pack. Be you, and be awesome!